What is the Best Orthodontist Treatment for Crowded Teeth? Braces? ALF Expansion? A few myths about crowded teeth debunked and what is the truth about crowded teeth? Crowded teeth is a cosmetic problem only? False. The mouth is supposed to be large enough to fit all the teeth side-by-side. Teeth Crowding is a major sign of under development. Small, under developed mouths are a major cause of TMJ Pain and Sleep Apnea in adulthood. Under Development is caused by Tied Tongue, Tied Lips and too soft of a diet. Tooth crowding should absolutely be treated and is best treated in childhood while a child is still growing. The earlier the intervention, the better. Orthodontics such as Clear Braces and Braces are the only way to correct Teeth Crowding. False. The best way to correct crowded teeth is with an ALF appliance or DNA appliance. These appliances create more room in your jaws and mouth so all your teeth can fit side-by-side. Braces still may be necessary, but if proper space is not created for the teeth and tongue to fit properly, the teeth will move back and not be in a stable position. Kids with teeth crowding have too many teeth and some teeth will need to be pulled to create room. False. Teeth Crowding is a sign of under development. Never Pull teeth other than maybe wisdom teeth for braces or any other orthodontic treatment. Common causes of under development should be diagnosed and treated. Pulling teeth and retraction orthodontics can permanently decrease the size of a child’s mouth, nasal passageways and airway. The common causes of under development are: A) Tongue Tie B) Lip Tie and C) Poor nutrition D) Lack of hard foods in the diet. Often times, treating Tongue Ties etc. can be enough alone to correct mild teeth crowding in a young child. If treating a tongue tie alone is not enough, the use of an ALF appliance will expand the jaws and develop enough new jaw bone growth to fit all the teeth. 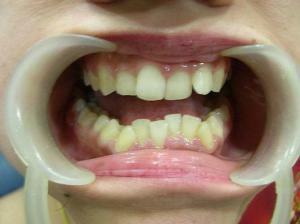 It is best to get proper jaw bone growth prior to straightening teeth with braces. It is best to wait for all the baby teeth to fall out prior to doing any orthodontic / orthopedic treatment. False. Once all the baby teeth have fallen out, a child is completed 80-90% of their growth. It is best to correct tooth crowding while a child is still growing.